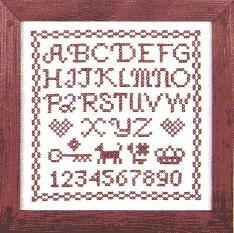 Home > Beginner > Redwork 9" x 9"
This striking red alphabet and motif is a basic designed stamped cross stitch sampler in a larger X stitch.Since the craft stamped sampler is in a larger stitch, it works up faster, with a sophisticated look. These Beginner or Larger X stitch stamped sampler kits are 8 to the inch , whereas our conventional cross stitch is 10 to the inch. Good for beginners or for those who eyes have changed Striking red alphabet and motif work up quickly. Fun for beginners and experienced cross stitchers alike. I purchased this sampler for my 10 year old Granddaughter, to teach her how to embroider. She chose this sampler and is enjoying learning how to embroider. The cloth is a nice quality and is easy to work with. She can't wait to finish and frame it.